I love the polish of the taffeta and the extra-wide width of each panel, so that I can create an expansive look to my living room windows and doors, which I consider to be the focus of the home. I am so pleased with these taffeta silver curtains because they truly provide the "Blackout" property that I was seeking. The lavish look of the Silver taffeta drapes well and conveys a classic statement of good taste. The extended width of my patio door, combined with the added benefit of the blackout feature sold me for when I entertain guests. The protection from the direct rays during the day, and privacy in the evening is well worth the money spent. I rate them a 5 star investment. These are packaged well with minimum wrinkles and arrived quickly. 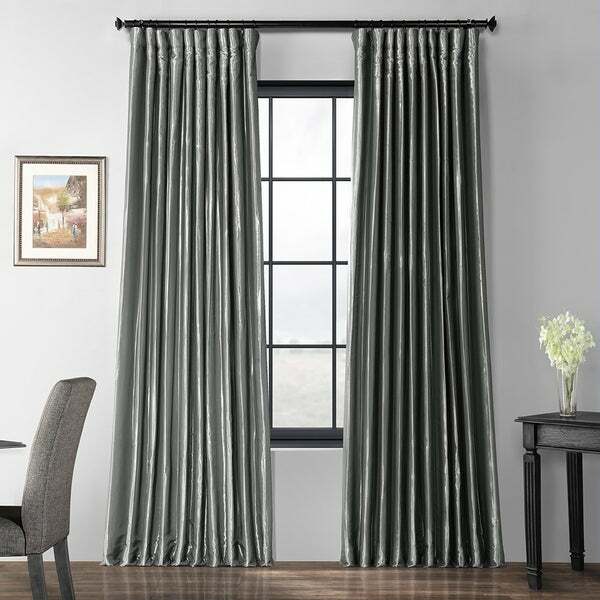 Recreate elegance in your living room as you frame your windows with this faux-silk taffeta curtain. Featuring light-blocking and thermal properties, this shimmering grey curtain gives you privacy and warmth. These curtains are great quality and block out the light. Exactly as listed. The fabric is great quality. Quality and price was what I was looking for. This Exclusive Polished Silver Blackout Extra-wide Silk Taffeta curtain in a long length fit the bill. I'm hanging my curtains higher and wider, since I've checked out some of the tutorials that were suggested. Thanks for the helpful tips ... My home is looking gorgeous with just a few simple changes, I feel so much more modernized and happy to just indulge in being at home. Your surroundings DO matter! "What is the weight per panel? Thanks!" These panels are approximately 9 lbs in the smallest size of 50" x 84" up to approximately 11 lbs in the largest size of 50" x 120". These are 100 inches wide.